Today is the Fourth of July, and I took Monday off to play with my parents, so this work-week was only three days long for me; woot! Only three days and it still took an embarrassing amount of coffee – with an even more embarrassing amount of sugar – to get me through. I didn’t do the best job of documenting, but I do have photos of every single lunch and dinner. And I won’t post details, but I do want to check in and mention that I’ve been consistent with my workouts ever since last week’s plea to hold me accountable. Crossing my fingers that I keep my momentum going! 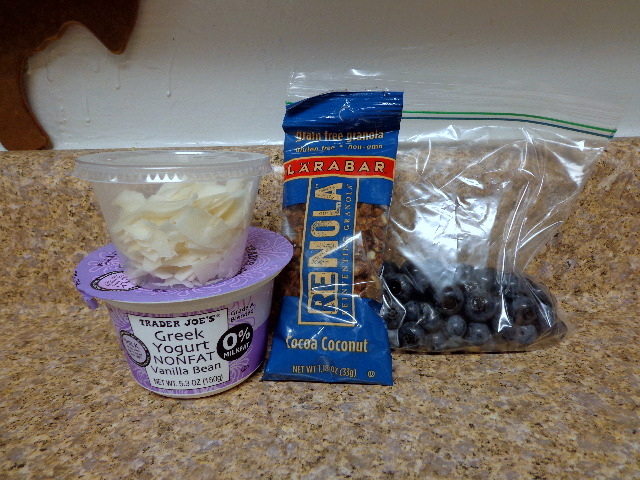 My lunches this week all included free samples from LÄRABAR. 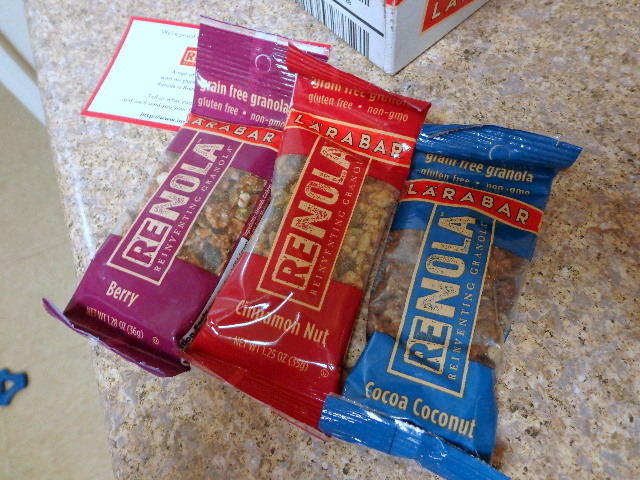 Please note, the RENOLA was sent to me free of charge to review. I was not provided with further compensation for this post. All opinions are my own. 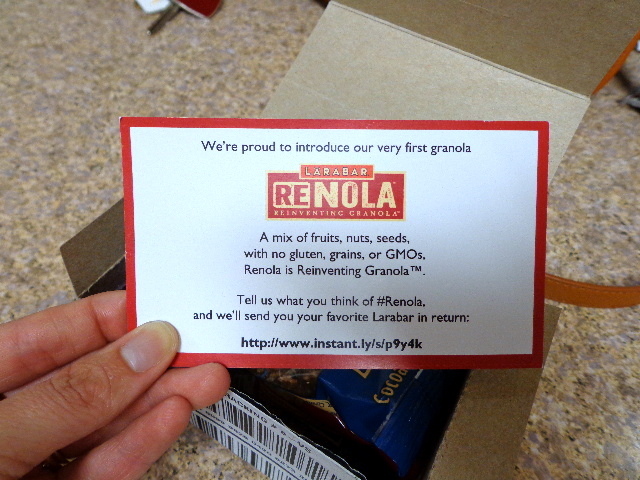 They sent me a box to introduce their new RENOLA – grain free granola made with non-GMO fruits, nuts, and seeds. 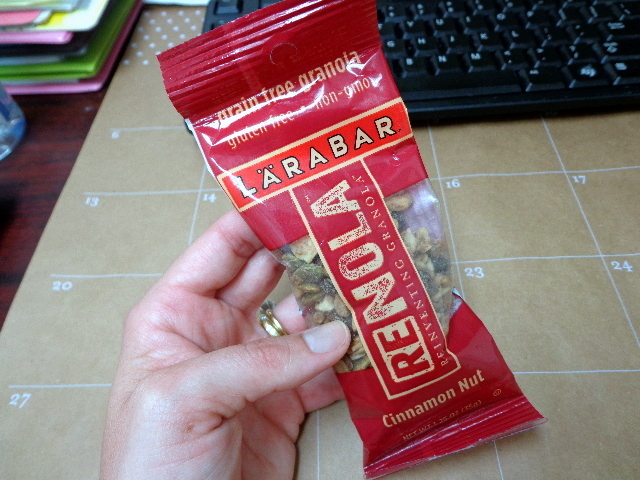 I think calling this “granola” may be a bit disingenuous, but it is a quite fabulous fruit, nut, and seed blend. 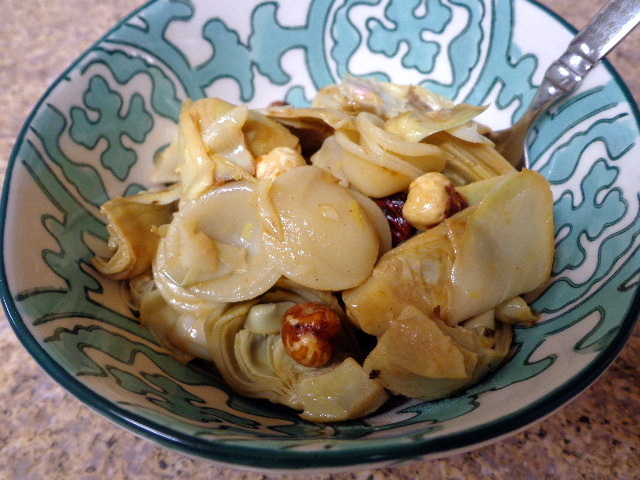 The texture is very pleasing; fantastically crunchy. It did taste absolutely delicious on yogurt and in cereal though, so if you are turned off by your oats getting soggy in milk then this product would definitely be a good fit for you. The pouches are nice and filling, thanks to 2 -3 grams of fiber and 5 – 8 grams of protein for 200 calories. 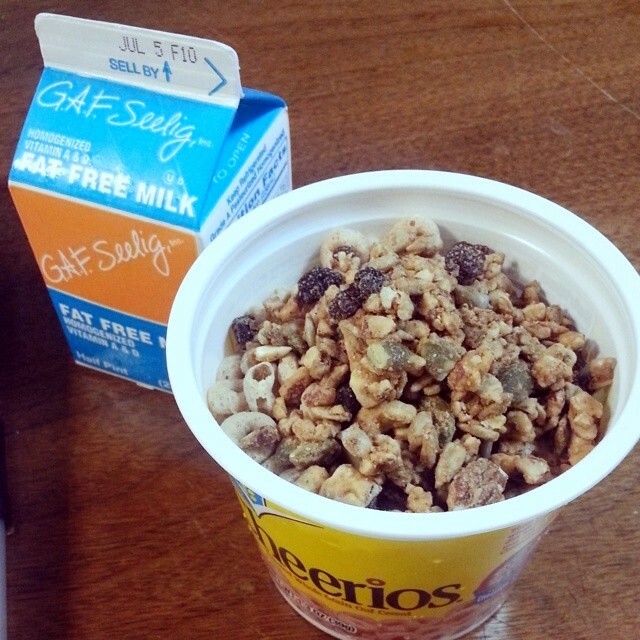 Tuesday, I had Cinnamon Nut with Cheerios and skim milk. 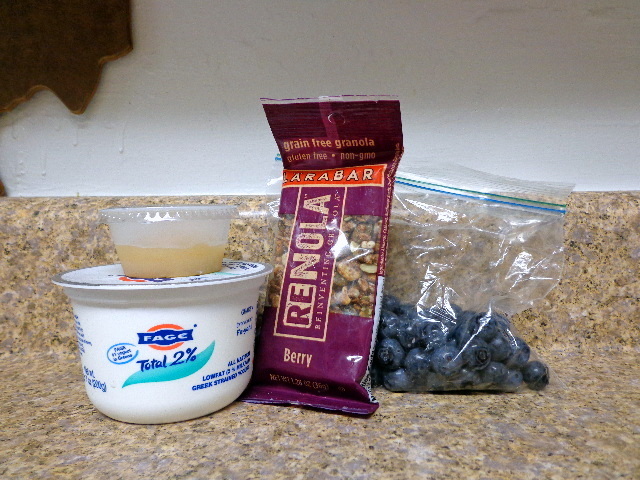 Wednesday, I had Berry with Fage 2% plain Greek yogurt, Meyer lemon curd, and blueberries. 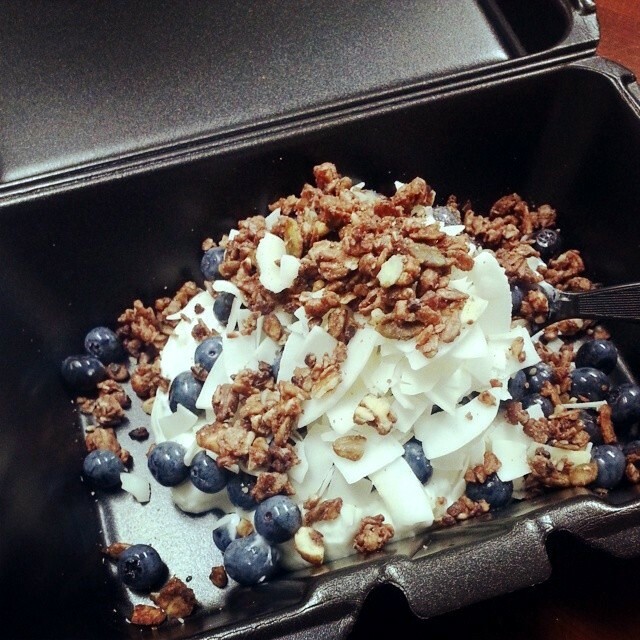 And Thursday, I had Cocoa Coconut with vanilla bean Greek yogurt, roasted coconut, and blueberries. The coconut-heavy bowl was my favorite lunch of the week. Snacks worth noting were all in the chocolate family. 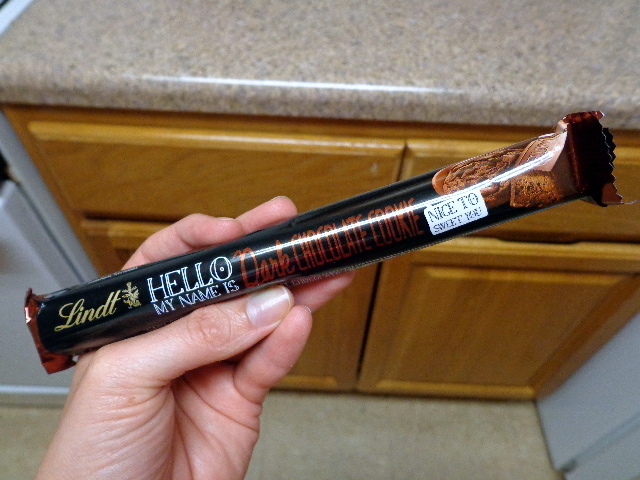 A Lindt Dark Chocolate Cookie Bar. 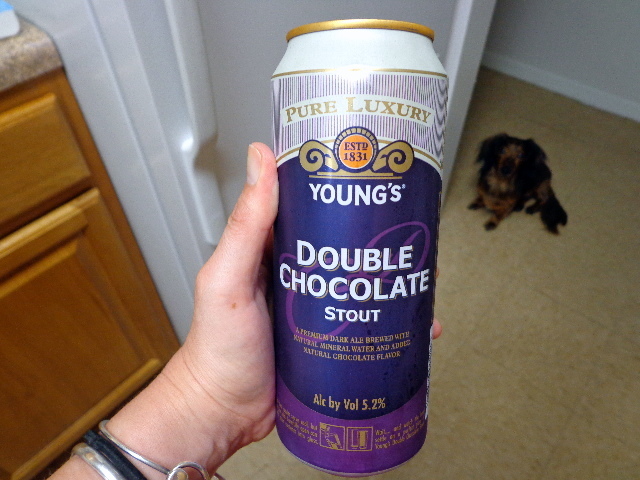 And a Young’s Double Chocolate Stout. I didn’t have the candy and the stout at the same time but I totally should have. I could not believe how yummy the beer was; it is rare that I finish a whole beer but this one I happily slurped down. I think four days straight of all meals out with my parents helped get me in the kitchen mood because I managed to make an actual meal every night this week. Tuesday was more on the semi-homemade side, we ate gussied up bowls of my leftovers from Sunday. 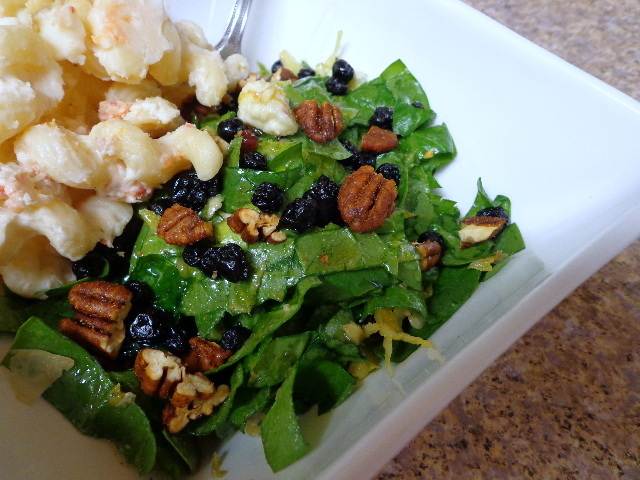 I beefed up my leftover shredded Brussels sprouts with chopped baby spinach, dried blueberries, sweet and spicy pecans, and a dressing blend of evoo, honey, and truffle salt. 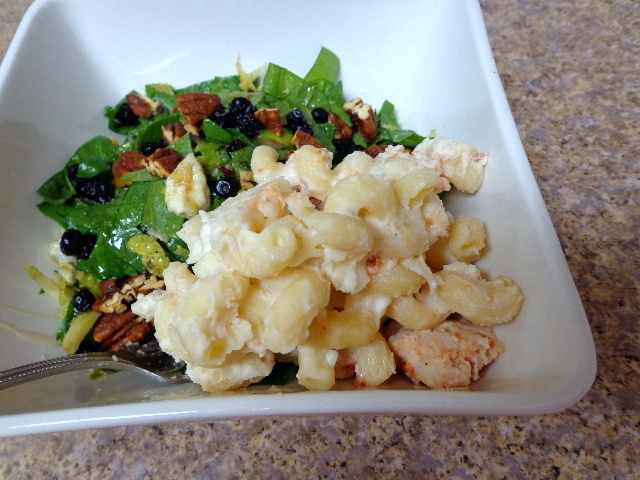 With a scoop of lobster mac and cheese on top. Just so good. 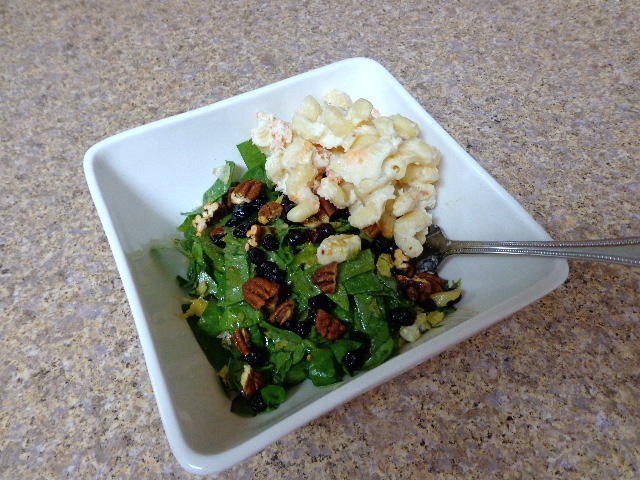 And it’s a testament to the “dressing” that I enjoyed the salad bites even more than the lobster mac. Wednesday we had very monochromatic pasta bowls. 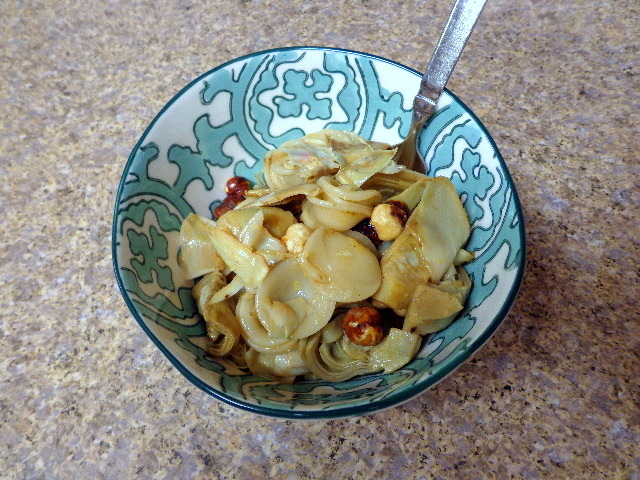 Orecchiette with tons of artichokes – frozen from TJ’s that I sautéed in evoo with lemon juice – and lemon zest, browned butter, and toasted hazelnuts. I snuck my green into my appetizer. Nachos! 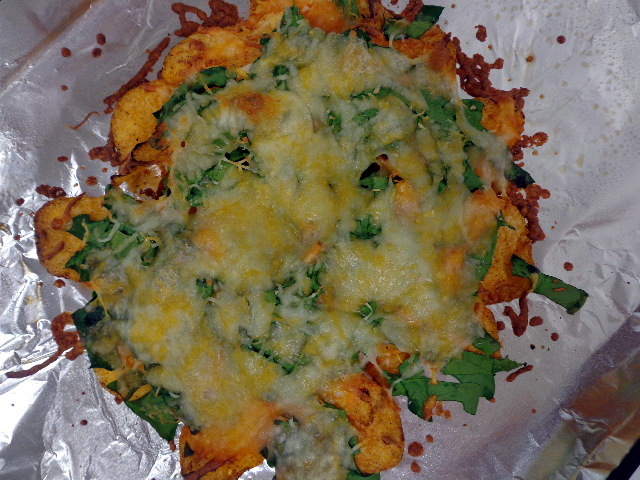 BBQ chips baked with chopped spinach and three cheese blend. 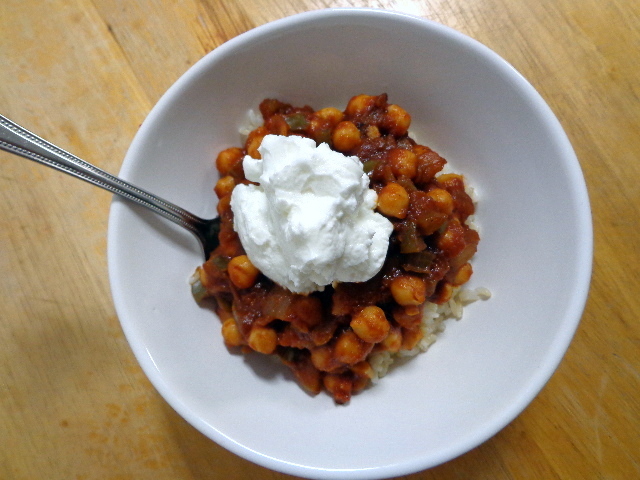 Last night I made a very loosely inspired version of chana masala. 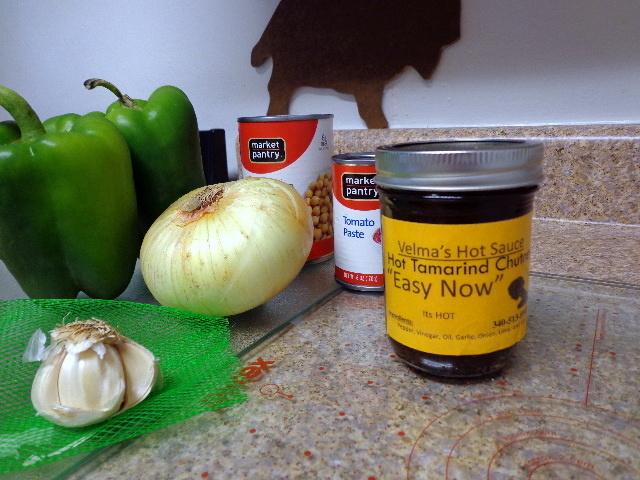 Chickpeas cooked with chopped onion, diced green pepper, garlic, tomato paste, and super spicy tamarind chutney. 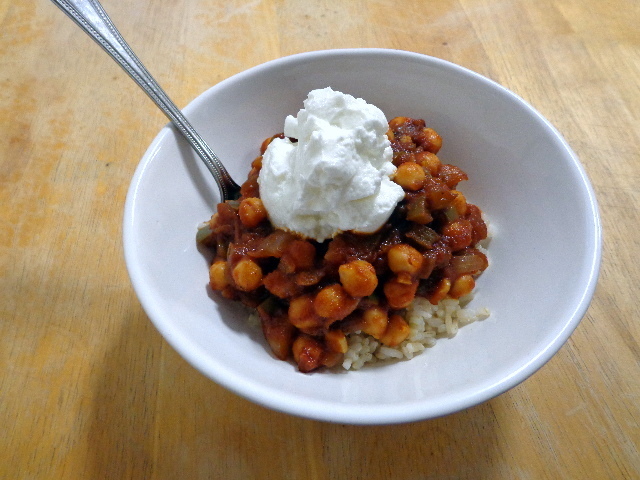 Served on brown rice with a scoop of plain Greek yogurt on top. This meal was wicked good! I went back for another bowl of just the veggie mixture because I couldn’t stop thinking about how tasty it was. Go me.